Gaming notebooks belong to a special class of machines. Two years ago questions about gaming notebooks would only irritate professionals - "Why? A notebook is not a desktop!" But time flies. Notebooks were replacing home desktops in all fields. Only 3D games held their ground because of high requirements to performance. However, it's not reasonable to buy a big desktop only for games, while its other functions are performed well by a small notebook. That's why more and more potential buyers of notebooks would like to use a notebook not only for work, but also for entertainment. And 3D games are a significant part of it. If there is demand, there will certainly be supply. There started to appear notebooks for games. As their components grew more powerful, they started to compete with desktops almost on a par. On the other hand, the main problems of notebooks remain. Namely: a small case, problems with channelling the heat away, power consumption requirements, and low upgradability. Today we are going to review the latest model from Acer, which is designed for gaming. Let's see how it copes with games as well as other home tasks. the first notebook in the new stunning Gemstone design. 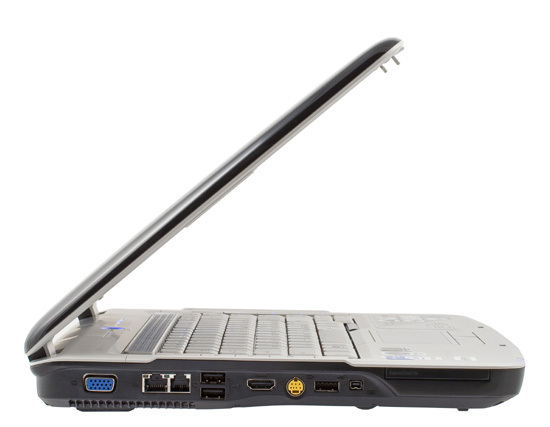 Able to satisfy all requirements of a modern user, the Aspire 5920 is based on the latest Core 2 Duo processor. The graphics component is really splendid: wide 15.4" panel, Acer CrystalBrite technology, 8 ms response, with the NVidia GeForce 8600M-GT graphics card (up to 512 MB, some cards have 256 MB) of the latest generation with DX10 support. The excellent image comes with splendid audio owing to the 2.1 audio system (two speakers and a subwoofer) supporting Dolby Home Theatre Virtual Surround. Besides, a HDMI connector and a built-in HD DVD drive (in some models) open up the door to the age of high definition video. The Acer Aspire 5920 notebooks are truly multi-functional. They can impress even the most hard-driving users. The Aspire 5920 provides unforgettable impressions with its audio system (two speakers and a subwoofer) supporting Dolby Home Theater Virtual Surround Sound HDMI, HD audio/video port, HD DVD drive (in some models), and an optional built-in TV-tuner. I generally agree with the description. But I would have also added gaming features of the 5920 to the list of its advantages. Dolby-certified surround-sound system with two integrated stereo speakers (Acer 3DSonic) and one subwoofer supporting low-frequency effects. 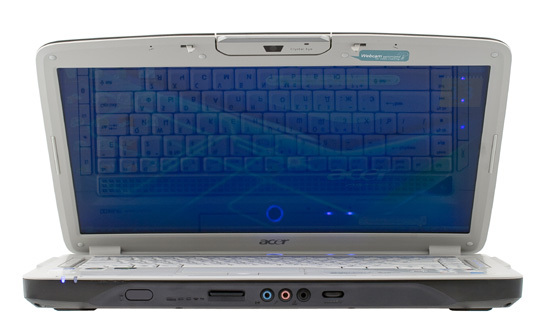 Acer PureZone support - it uses two built-in microphones for high-quality recording and better voice rendition. The bundle is minimalist. You even have to create a system restore disc on your own. We ran the tests in real applications and measured battery life of the notebook. We ran two types of tests: reading a pdf file, and watching a movie. The notebook hibernated in compliance with its OS settings, when 4% of battery charge was left. Its battery life is impressive for a desktop model. However, don't forget that a powerful configuration is spiced up with a powerful battery, 66718 mWh according to the test. Just like in tests of other notebooks, we faced the problem with Call of Duty 2 (the game crashes only in Vista, it runs well in XP) and Call of Huarez (it does not work correctly), so we excluded these two games from the test. We should note one peculiarity of this test - if a resolution in the test is higher than resolution of the panel, the test shows results for 640x480. So test resolutions were lower than the screen resolution. These results give a good idea of the notebook's performance. As you can see, the Acer 5920G copes well with all games, at least with our settings. First of all, the keyboard is quite resilient, it does not bend. It happens because the keys are soft to press, and the underlayer is hard, so it bends only if you ram the keys. In fact, this keyboard produces a surprisingly good impression, especially for its range. It's soft, it works well, even though it has a rubber-like feel. The keyboard layout is almost optimal. It's practically a copy of the desktop keyboard layout. The Ctrl key is in the corner, so you can easily switch to it from a desktop keyboard and back, and use the same key combinations. The home/end keys are arranged in a vertical line on the right. It's also very convenient. The ins/del keys are in the upper right corner, so it's convenient to use them while you edit text. I don't like where the dollar and euro sign keys are placed, but it's no problem at all. The touchpad is made of plastic, it's flush with the case. The plastic feels just like the one used in the case - it's not ribbed. The touchpad is big and convenient to use. In my opinion, the default repeat rate might have been a tad faster. The touchpad has two buttons and a four-way scroller. The buttons are rather hard, they work with plastic bounce. What concerns subjective impressions, I accidentally moved the mouse pointer from time to time as I typed, because I touched the touchpad with the left palm. The indicators are divided into two groups. The front panel houses power and battery indicators. It's blue, when the notebook is switched on, and it blinks red in idle mode. The same concerns a ring around the power button. The battery indicator is green in battery mode/when the battery is charged. It's red, when the battery is charging or when it's discharged. The second group of indicators is to the right of the power button: HDD (or optical drive) LED, caps and num lock LEDs. The indicators are bright blue, they are covered with a transparent plastic stripe. A corner insert to the left of the power button is also illuminated blue, when the notebook is connected to the mains. 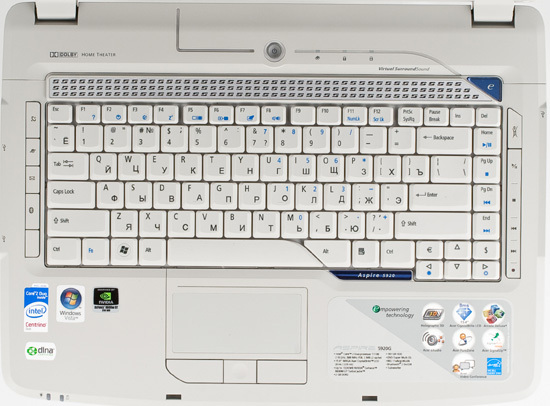 The Acer Aspire 5920G has two groups of extra buttons plus an additional button. 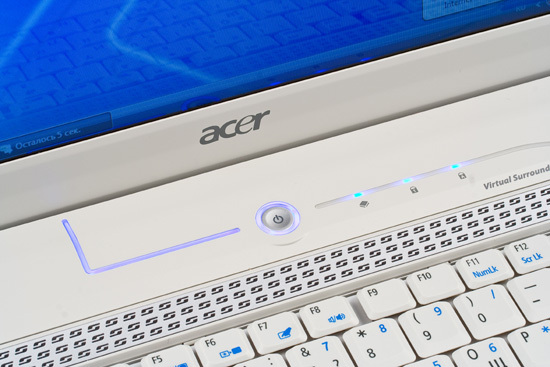 There are two rows of buttons to the left and right of the main keyboard, plus another large button to call Acer utilities is to the right and slightly above the keyboard. The left column contains four buttons. 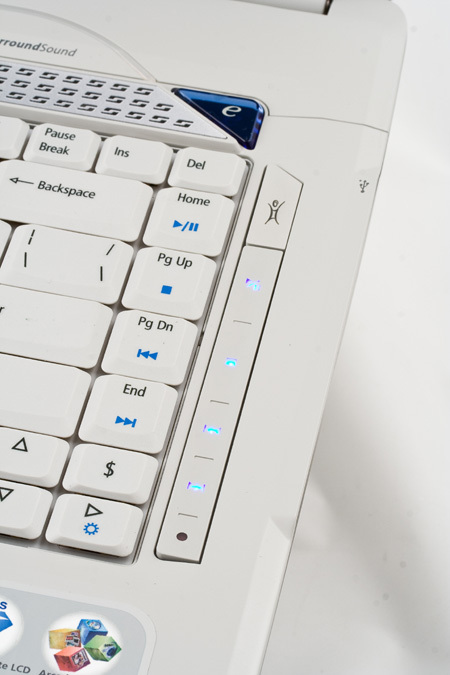 The top key enables Wi-Fi (the LED blinks red, when the notebook is searching a network, and it lights up when a connection is established). There are also buttons to start a web browser, an email client, and to enable bluetooth (it lights up blue, when the interface is activated). The layout of these buttons is very convenient, it's easy to use them and to read the LEDs. I had no problems with accidental key presses. The right column of buttons contains a single button on top and four sensor zones. When you press the button, the standard desktop is replaced with Acer Arcade deluxe - a graphics interface to choose multimedia functions. Here you can start programs to play DVD, edit video, record video clips, and work with digital video cameras. The sensor zones are responsible for media player functions (they are also accessible as FN combinations). But it should be mentioned that these buttons cannot control the Vista media player. And finally, the bottom zone (with a dark circle) starts the NTI DVD maker to burn optical discs. Unfortunately, you may often touch this zone with a palm, as you type (or move the cursor), so this program would start from time to time. The large button in the upper right corner displays gadgets, where you can choose a wireless profile, an acoustic profile, and a power profile. Let's mention Fn combinations. Fn + F1 displays a detailed help page with these combos. Fn+F2 starts eSettings, Fn+F3 - ePower. Just like in many notebooks, Fn+F4 puts a computer to sleep. Fn+F5 switches video output between the internal display and an external monitor. Fn+F6 disables backlight until a key is pressed to save power (it's a very useful feature in the battery mode). Fn+F7 disables/enables the touchpad - it's sometimes convenient to disable the touchpad, when you use a mouse. Fn+F8 enables/disables the built-in speakers. F11 and F12 are responsible for num and scroll lock. Acer offers the new notebooks in Gemstone design. It's an interesting concept, especially as the 5920G is a home model, so it should please a home user. The notebook has a black shiny lid and a matt black case, while its keyboard and the internal panel are made of beige plastic. So the open notebook looks homey - it does not have that cold electronic look of most notebooks. We should also mention that the gray color does not look easily soiled to me. So accumulated dust and dirt wouldn't be noticeable. The black lacquered lid also looks well. The question is in its durability, as usual. Such lids get scratched easily, although this is not relevant for a home computer, which is not transported very often. The case itself also has a pleasant design - the notebook looks elegant without being pretentious. 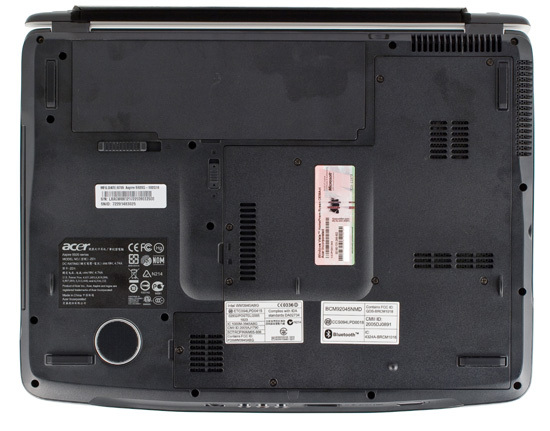 The Acer 5920G uses a number of original design elements. For example, I like the display lid latch - (1) it's big and easy to move with your finger; (2) you have to pull the latch up, to open the lid, that is you open the notebook in a single motion. 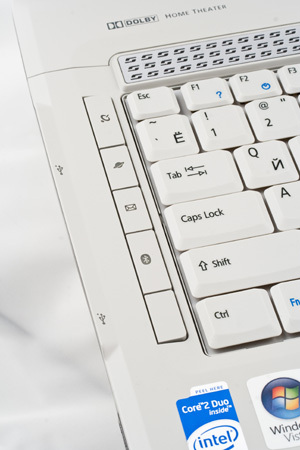 Design of the keyboard panel uses slanting lines. They also add originality to the notebook. But it still does not look pretentious. I don't think that users will get tired of this design. It was a good solution to place additional buttons at the sides of the keyboard. These buttons are very handy. Besides, the left buttons also allow to control the interface. It would have been great to have such quick launch buttons on the right, and to move the sensor media controls above the keyboard. There are also icons at the sides of the keyboard panel that indicate connectors on the flanks of the notebook. So it's very easy to find them - you don't have to bend over the notebook to see the flank with connectors. These are trifles, but they make your experience with the 5920 much more convenient. Let's have a look at the side connectors. The front panel houses (from left to right) an infrared port (it seems to work only with remote controls), a multi-format card reader, audio jacks (mic-in, headphones-out, digital-in), a volume wheel - it's probably the most convenient way. The rear panel contains only a power connector. You'll have to close the lid before plugging the cord in - it's too close to the center. It's OK for a desktop model. The left flank houses a lot of interfaces: VGA port, LAN and model ports, 2 x USB, HDMI, S-video, another USB port, FireWire, and an Expresscard slot placed closer to the front edge. The right flank contains a DVD-Multi drive, another USB port, and a Kensington lock hole. On the whole, the Acer 5920 produces a very nice impression: it looks attractive, it has good ergonomics, and an excellent set of ports for home use. The 5920 comes with a TN-film panel with all characteristic features of this technology. It has narrow angles of view, especially vertical ones - it changes colors or even inverts them when you move your head. However, it happens only if you look at the display from a distance. On the other hand, the notebook is equipped with brighter backlight lamps, so it's quite good at games and movies. By the way, the display has a mirror coating, which reflects the room, if you sit against the light. However, this display works well in a room - just don't put it facing a window. And finally, a big advantage of this panel for a gaming notebook is that it belongs to the latest generation with 8 ms response. The panel is really fast, we saw no blurs in games and movies at all. The audio system is also much better than usual. 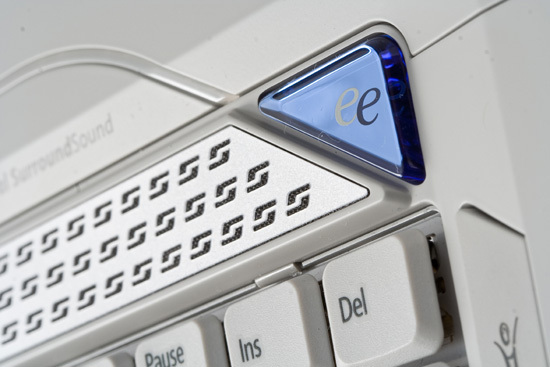 High-frequency speakers are installed under a ribbed decorative insert over the keyboard. Besides, there is quite a large speaker on the bottom of the notebook. The acoustic system produces a very nice impression. The sound is loud and clear. You can listen to music and watch movies even in a noisy room. The system lacks low frequencies, of course, but it's very hard to achieve better results in such a small case. It's very hard to realize the sound source. You just know that the sound comes from a notebook, but the exact source is not clear. The stereo effect is also weak. The sound quality produces a very good impression - you can listen to music and watch movies with the built-in speakers without spoiling the impression. We should also mention the volume control in the form of a wheel. It has no stops, volume is controlled on the software level. The notebook has a good ventilation system. The fan rotates constantly at a relatively high speed. Nevertheless, it's almost inaudible. Low humming is not noticeable at a constant rotational speed. Besides, the exhaust grid is on the rear panel. 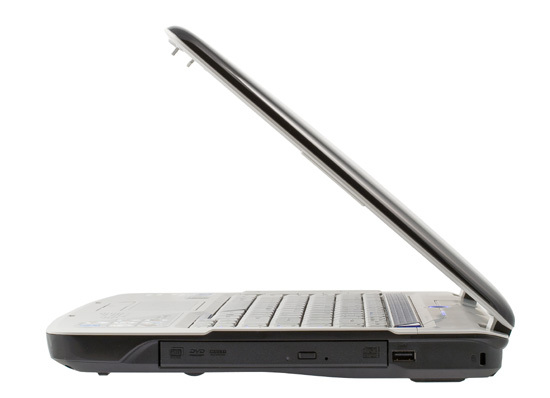 The notebook does not get very hot in the standard mode, for example when you work or watch a movie. Only the left wrist pad and the corresponding place on the bottom get warm. However, the 5920 is a gaming computer. Games have the highest hardware requirements. So we decided to test the notebook with lengthy gaming sessions. Powerful and hard-driving "You are empty" heats the notebook very much. The entire left side gets so hot that it's even problematic to hold it. However, the notebook froze only one time after 3-4 hours of gaming, and it was stifling outside (28°-30°C). No more freezes. The notebook is noticeably cooler in less difficult games (such as Battlefield Vietnam). 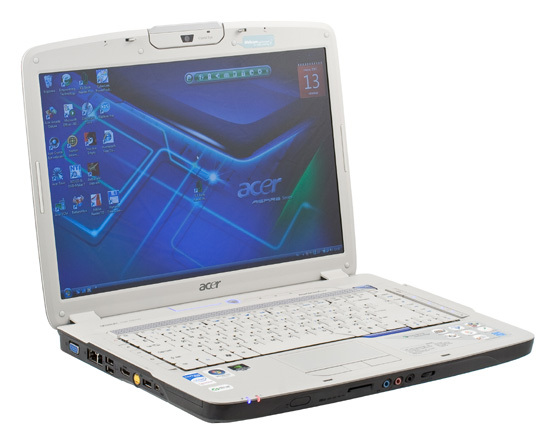 Along with programs described in the Extra section, the notebook comes with the standard Acer's set of utilities. 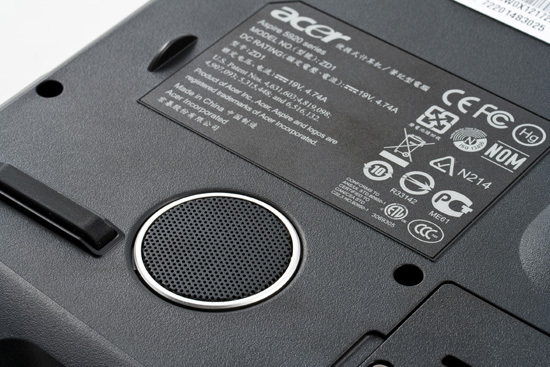 They are described in detail in the Acer Travelmate 3045 review. The 5920 has additional functionality for video conferencing. 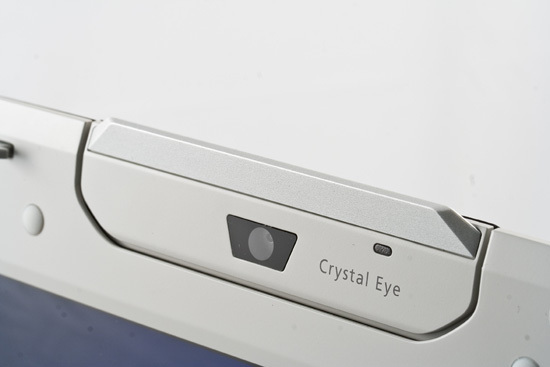 We mean a web camera with the Crystal eye technology as well as two (!) microphones built into the upper part of the panel frame. We mostly used the notebook to play movies and games. It coped with both tasks well. Its powerful configuration, including the latest graphics card, allows to cope with most modern games. We should mention good gaming performance and fast panel - these features combined produce a good impression. Everything is OK with movies as well, especially watching them solo. Image quality is acceptable, you can watch movies well without connecting an external acoustic system. 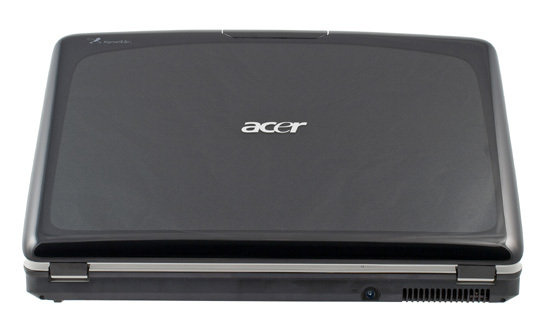 Acer 5920G is an all-purpose home notebook. It easily copes with all domestic tasks: Web surfing, editing texts and spreadsheets, playing music and movies, and games. This notebook has everything necessary for a home user - a bright panel, good speakers, an excellent keyboard, a good set of expansion ports, an attractive design. It's a big all-purpose notebook that looks well at home. It copes with all domestic tasks including modern games. It has a homey design, calm but interesting. At the same time, it has a reasonable price. In my opinion, this good balance of high functionality and ergonomics for a reasonable price will become a visiting card of this notebook on the market.